As a business owner, you should never overlook the importance of having a reliable HVAC system. Not only will it ensure the comfort of your customers, but a well-maintained heating system will also prevent health and productivity issues in your staff. This is especially true when temperatures start to dive during the winter season. At the same time, undiagnosed problems may cause heating systems to consume more power than they actually need. When it comes down to it, you’re either enduring the cold or pouring money down the drain on a heating system that badly requires servicing. Expertise with all types of HVAC equipment -­ We guarantee that our technicians are trained and certified to handle all types of heating equipment; ­be it multi-boilers, unit heaters, or heat pump systems. Reliable service history -­ You don’t have to ask around! We’re more than willing to share our work history for the peace of mind you deserve. Replacements and upgrades – ­If you think your commercial heating system is no longer cut out for the job, we can help you replace or upgrade it. 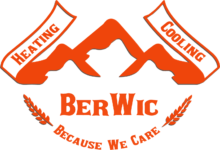 24/7 emergency service -­ Here at Berwic, we value your time as if it’s ours, which is why our steadfast team of technicians is always on standby to attend to your needs. Contact Our Fort Mcmurray Plumbing and Heating Office Today to book your appointment. Dial (587) 275­-4822 now and let our technicians get to the bottom of your commercial heating woes!